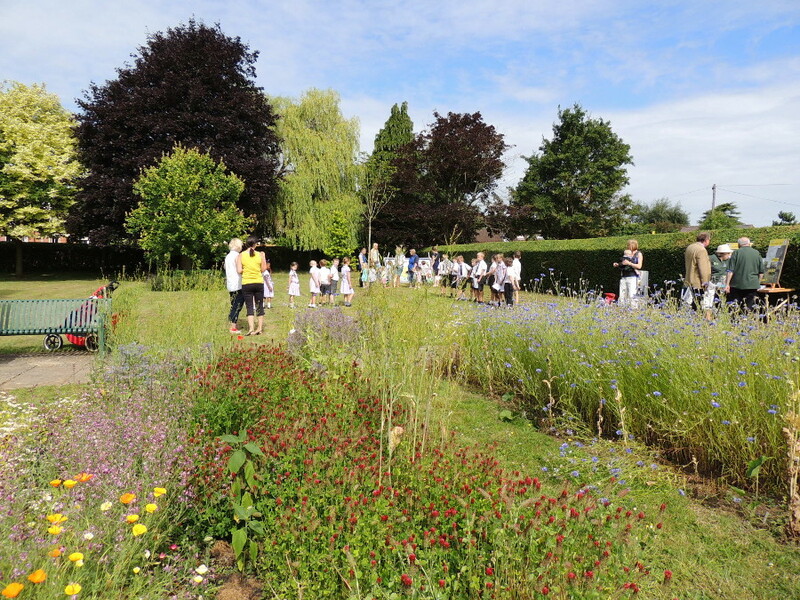 The original aim was to create a community permaculture garden, with perennial and annual vegetables and herbs as well as wildflowers, and we had many successes during the first year, with the wild flowers looking particularly stunning during June and July. 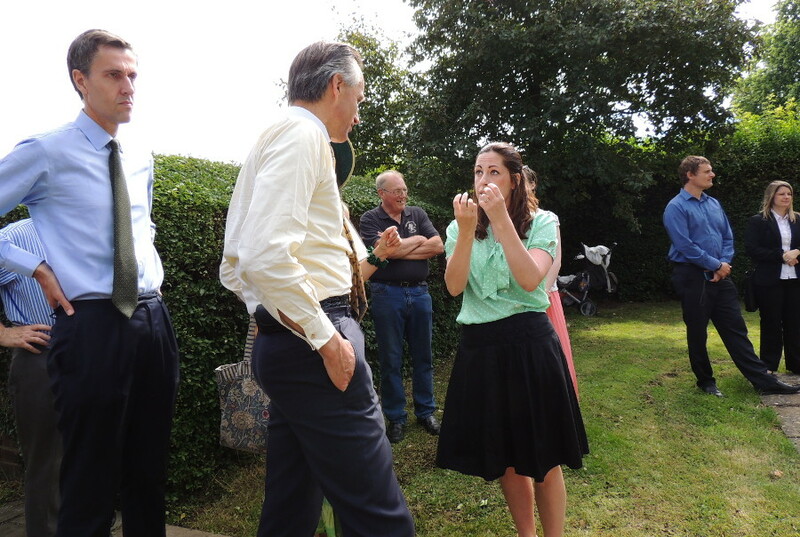 In July 2014 we had a visit from our local MP, Andrew Selous, and Lord de Mauley, who was a minister in the Department for Environment, Food and Rural Affairs (Defra). 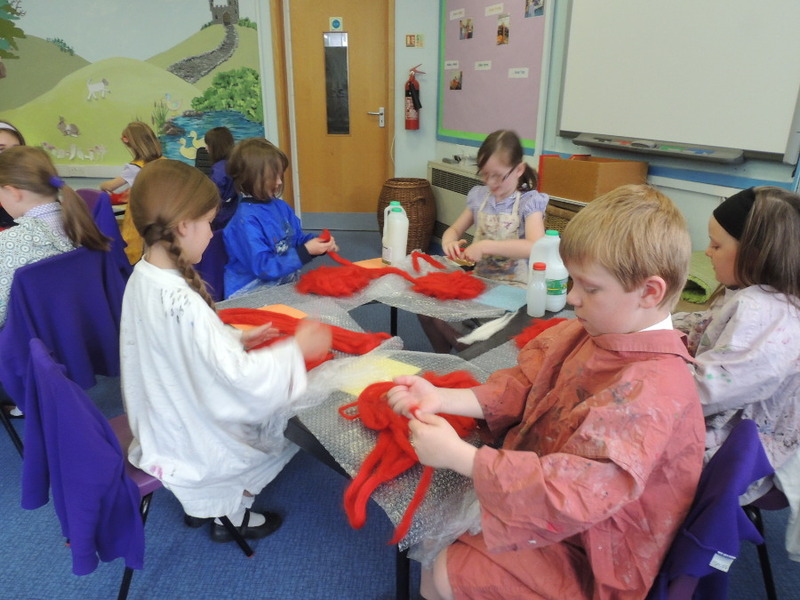 In June, local artist Rosalind Castling worked with children from Heathwood Lower School to make felt poppies to place in the gardens on Remembrance Day. In July 2015, we entered the gardens for the Anglia In Bloom competition. 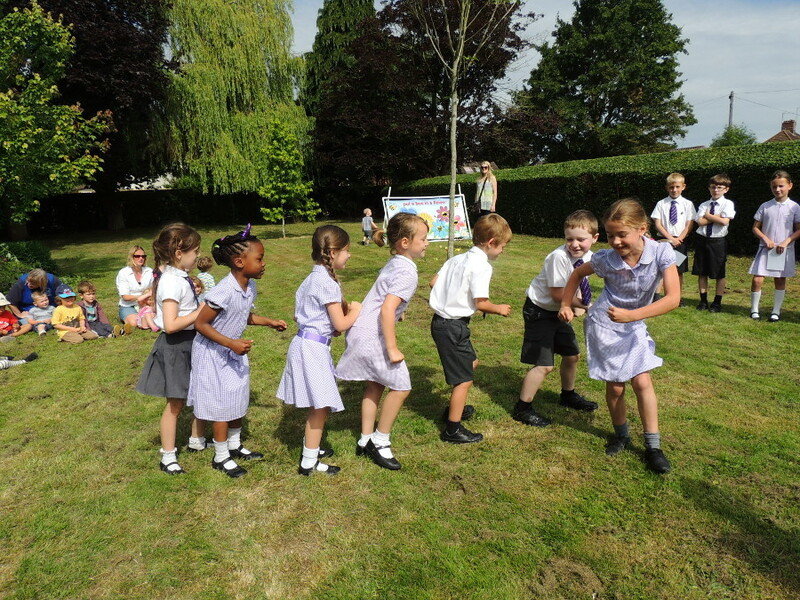 Heathwood School came along on the judging day to place their felt poppies in the garden, and to show the judges their bees waggle dance. 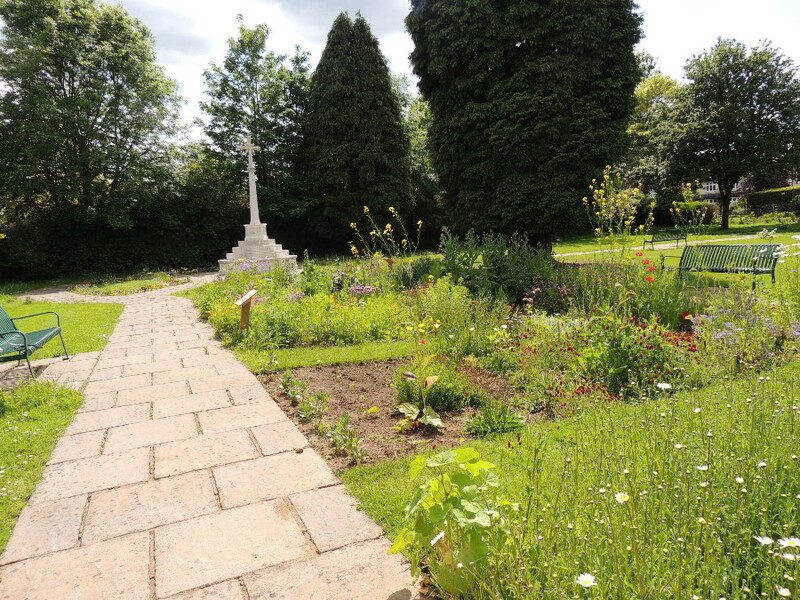 The gardens won a special award in the World War 2 Memorial category. 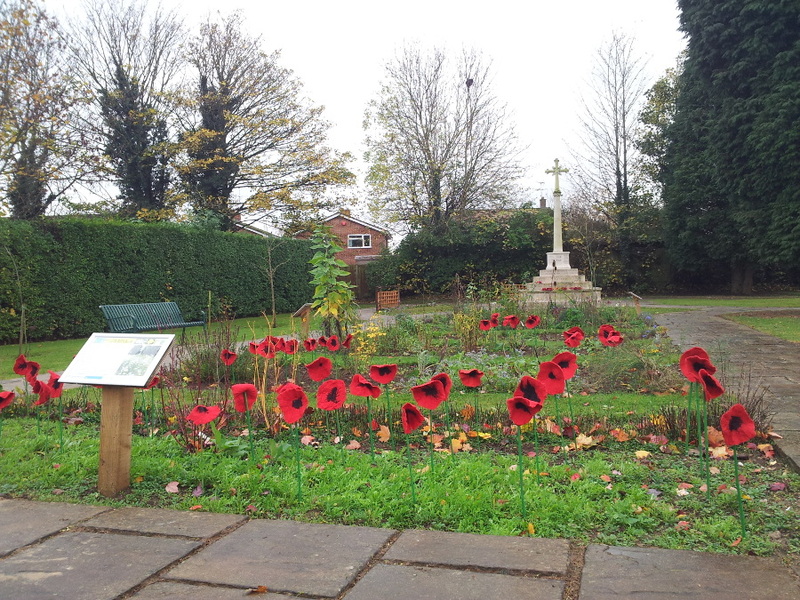 The children’s felt poppies were perfect for the Remembrance Day celebrations, when most of the gardens were empty. 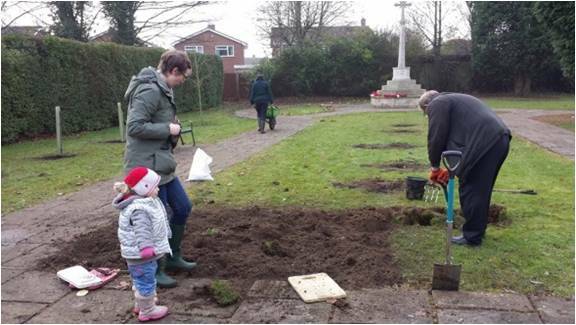 In autumn 2015, we looked back at what we’d achieved, and thought about how we could best balance our aims of supporting bees and providing hibernation areas for insects and other wildlife, while respecting the setting around the war memorial. Holly Allen and Joanna Mee drew up a slightly revised plan, with a more formal structure of shrubs in the centres of the beds and lavender along the sides, within which we would introduce many different garden flowers that are particularly attractive to bees and other pollinators, as well as keeping the wildflower bed. We also grow some wildflowers such as campion, meadow cranesbill, Jacob’s ladder and musk mallow in the more formal beds. 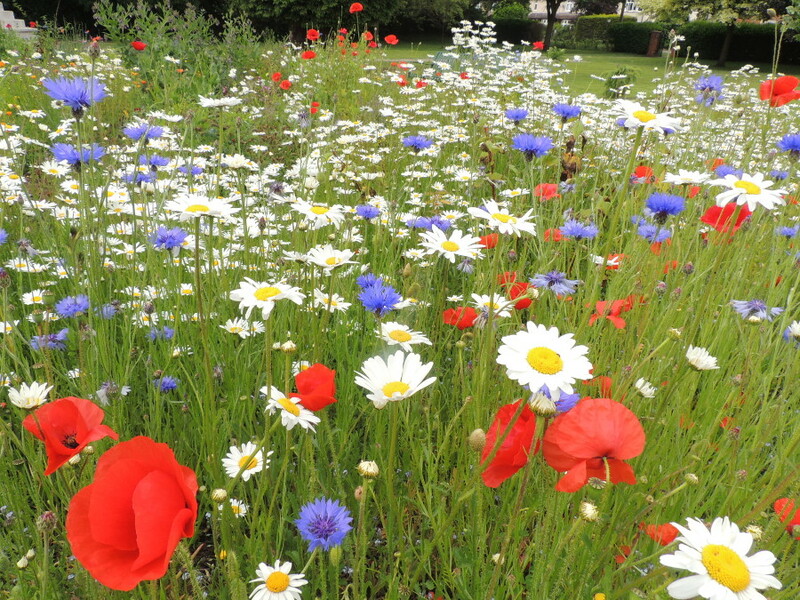 We try to provide pollen and nectar right through the year – last year bees were flying on warm days right through the winter, and we had a few plants in flower for them then, too. Rather than cutting all the plants down as soon as they’ve finished flowering, we still leave many stems and leaves to provide hibernation sites for ladybirds and other insects. We only cut them down when they begin to look too untidy for this more formal setting. We try to keep the ground covered with non-invasive plants like red deadnettle, black medick and germander speedwell, to provide hibernation sites over the winter and contribute nectar and pollen for bees early in the spring. By using many more perennial plants we’ve drastically reduced the need for much watering and weeding. The one exception to this general plan is the bed where children from the local preschool grow flowers and vegetables. In 2016 they grew peas, beans, carrots and pot marigolds, and they enjoyed watched the bees, butterflies, dragonflies and other insects that visit their garden. They’ve made bird feeders and hung them in the trees, and they’ve watered plants all over the gardens – that’s probably been their favourite activity. 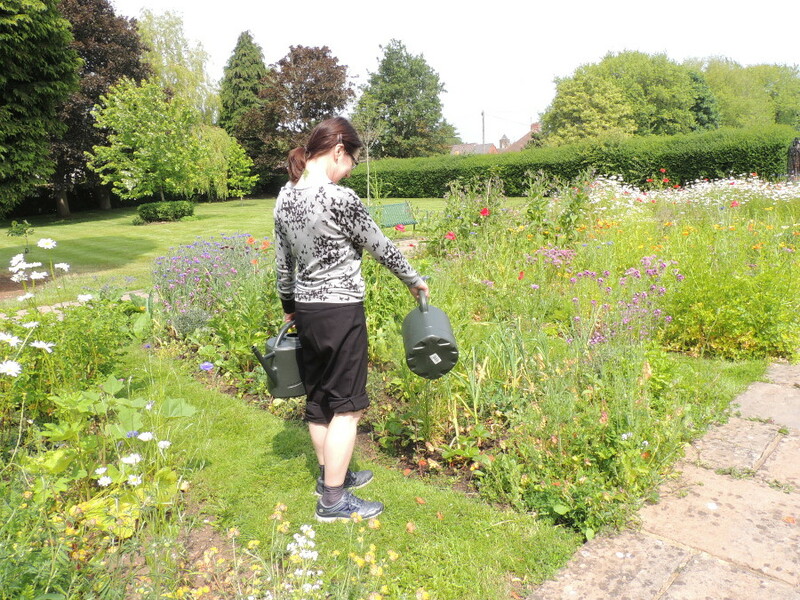 We’ve also had visits from other groups in the town to help us carry out surveys and generally helping maintain the gardens. It’ll take another couple of seasons before the gardens are really mature, as it takes time for the perennial plants to put down strong roots and spread to cover the ground. In the meantime, we’re filling gaps with annuals and herbs, and learning what really thrives here and what doesn’t. We’re also trying to establish a garden that doesn’t need much watering apart from when we’re establishing young plants, and we’re working hard towards eliminating all use of peat. 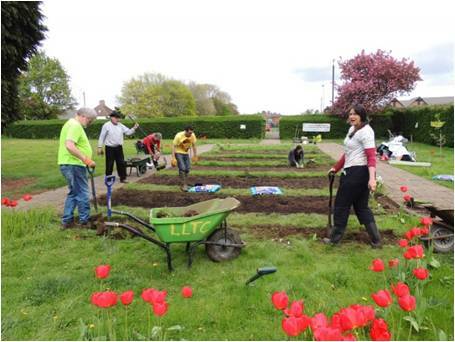 Throughout the project, we’ve had a lot of very encouraging comments from passers-by while we’ve been working in the garden – we had no idea how many people came in to spend some time there, enjoying the peaceful atmosphere and watching the plants develop.